The Two Tracks are returning to the WYO Theater stage April 6, joined by Sarah Sample. Heart-felt emotion, honesty, and conviction define The Two Tracks’ sound. Their Sheridan roots shine throughout their music, which has received top honors from Wyoming Public Radio listeners as well as national media. 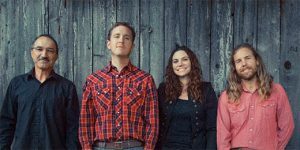 Their live show is a joyful romp of Americana with affecting imagery and storytelling supported by rich harmonies, a solid groove, and the unique addition of bluegrass cello. The Two Tracks are excited to return for their third performance on the WYO stage.